Monday, April 20, at 5 pm in room 9A. A film by Julien Duvivier, 1952, starring Fernandel and Gino Cervi. 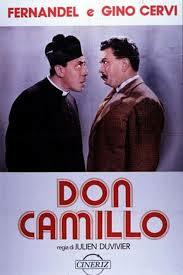 Comedy on the strong rivalry between a Catholic parish priest and a Communist Mayor in a rural town in Emilia. First of a series of movies, inspired by the saga written by Giovanni Guareschi.